We took a three hour bus ride from Bratislava to Budapest, Hungary. To pass the time during the bus ride we watched the movie, Mystic River. We arrived to a rainy Budapest- it really seems to rain a lot in Europe in the winter! The bus dropped us off outside of the city and our initial impressions of Budapest were not spectacular- shaped by the high number of homeless people at the subway station and the outdated, rickety subway cars. However, after taking the subway to a more central location in Budapest our eyes were opened to the beauty of the city. Unable to check into our AirBnB apartment for two more hours, we took to the streets in the rain. We walked the Pest side of the city uncovering high end shopping streets, dozens of Turkish döner kebap (a theme throughout Europe) restaurants and a unique charm to the city. Modern stores occupied the bottom floors of grand buildings left over from another area. It was nice to see new and old coexisting. Our rented apartment was located in Pest in the old Jewish quarter and remnants of that still remain- Jewish restaurants and several striking synagogues. This area was where the Jews lived during the war but is currently being transformed and is informally called the Ruin District. Trendy "ruin bars" are popping up in old buildings, protecting the building from being torn down and preserving the facade. Inside they breathe new life into these buildings that harbor some depressing history. We walked down the street toward our rented our apartment and immediately recognized we were in a happening area with hip restaurants, bars, cafes, street food. Our airbnb host let us into the apartment and gave us a brief introduction of the place- she was very organized and well prepared as she and her boyfriend own the apartment solely for renting out. She told us that the building that the apartment is in used to hold Jewish families during the war who were related from their homes into the Jewish quarter. She went through her checklist the sat us down with a map circling places to go and restaurant and bar suggestions. We very much appreciate good advice from locals. She told us about three Turkish thermal baths in the city and we chose the largest to try later that evening. We walked from our apartment down a busy Main Street toward the Turkish baths. The large road terminated at the base of a beautiful square adorned with... Statues called heroes square. The name is fitting because the way the statues were lit up gave them a powerful and godlike quality. We continued past the square and into the park observing a large and lively ice skating rink. We found the bath house on our left a bit farther into the park. It was in an enormous and beautiful building. The bath was opened until 10pm and we arrived around 6:30. We choose the .... bath house because of its outdoor thermal pool. The first two entrances that we tried were no longer allowing visitors. We were redirected to the main entrance which is open until 10. We paid about $35 to enter and headed to our separate locker rooms to change. We found each other and went outside toward the giant steaming pool in the courtyard. We hurried through the cold air and into the hot water- now quite hot enough we both agreed. The pool was filled with tourists from all over the world. We made the most of our time at the pool but we were very disappointed that the steam rooms were already closed. We felt the experience was over priced and inauthentic. Maybe the other Turkish baths in town are better. We started our second day in Budapest with a free walking tour. We met with the english speaking guide in Pest. We walked around Pest stopping to see some monuments and churches and learn about their history. She told us about the Hungarian language and we were surprised to learn that the Hungarian language is actually more similar to Asian languages than other European languages. This can be traced back to the invasion of the Huns centuries ago. We followed the tour across the Danube River to the Buda side of the city. We crossed over the famous Chain Bridge, the oldest bridge in the city. Our guide joked that Buda is where people live and Pest is where people go to have fun. With the presence of so many ruinbars in Pest, I can believe it. We walked up to the castle where we saw the 12 o'clock changing of the guards. The change was theatrical with rehearsed moves to the beat of a drum. The whole procedure seemed outdated and dramatized but still was still quite entertaining. I couldn't help but think a soldiers time could be better spent on things other than learning choreographed dance moves. We walked farther into Pest and saw beautiful Mathias Church. This church as well as several other buildings we saw on the tour had intricate zigzagging tile work on the roof with striking pops of turquoise. This architectural style dates back to the 1800's. We learned more about Hungary from our guide and she shared that despite being a highly touristed city, Hungary has a very low GPD and a homeless problem. We stopped by two more sights before departing the tour- A horse statue with famous balls, rubbed for good luck by university students and an old run down car mockingly referred to as a "paper jaguar" because of the poor quality of materials used to make it. This car is a relic from socialism when families would apply for a car and wait up to 5-7 years to acquire one. At the conclusion of the tour we stopped into a pastry shop recommended by the tour guide for its authentic pastries at "local" prices. We tried a Hungarian strudel filled with apples and walnuts- just ok, could have been warmer. We headed over to the market hall back on the Pest side of the river. Inside the enormous building with vaulted ceilings were two floors of food. The bottom floor had stands selling produce, cheese, meat, and pastries while the top floor had stands selling traditional hot meals and souvenirs. We sampled a few bite-sized pastries filled plum, cabbage, cheese, and potato. Later that evening we went to sample Hungarian wines at a wine tasting bar. The bar had 56 varieties of Hungarian wine to try. The wines to try were in a fancy machine that required you put in a card, select the wine and amount you wanted- a pour, half pour or whole glass- and the cost would be charged to the card. At the end of the evening you pay for what you drank. We tried to be strategic in our wine tasting trying reds, whites and dessert wines. Prices were expensive (not for a tasting though), and some wines were a couple dollars just for a sip. We also found the machines to be a bit light handed as our half pours looked more like a pour and our full glasses looked more like a half pour. We enjoyed the wine with a cheese plate and read about wines on a tablet that they provided for us with detailed information about the wines, regions, and vineyards. The dessert wines from the town Tokaj, north east of Budapest, were the stars of the evening for us. We left the wine bar in search of a ruin bar to see for ourselves what the hype was all about. As we walked through the streets in the old Jewish quarter the town was lively and full of the an intangible energy. People were out and about, inviting bars and restaurants were open, and music was playing. 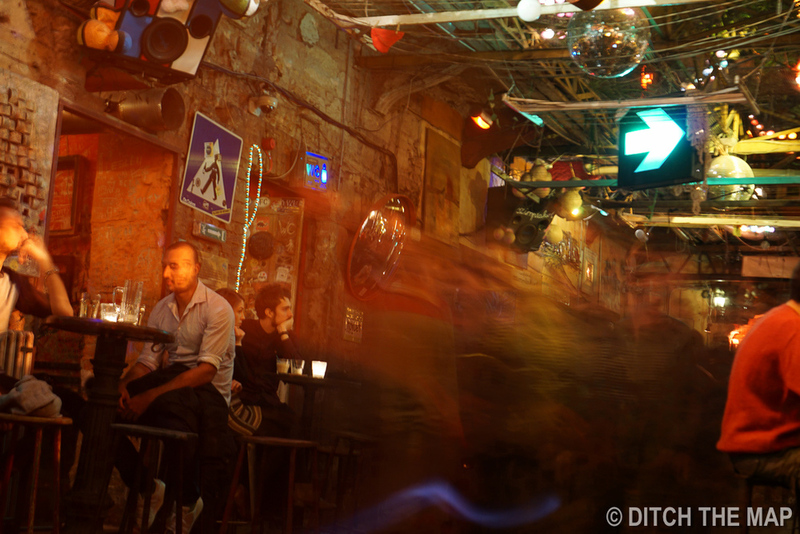 Budapest is known for its nightlife and we can see why. 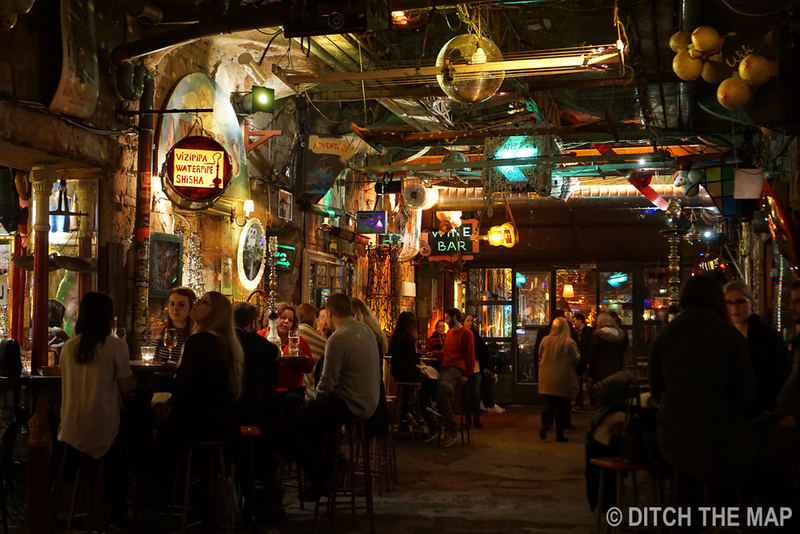 You can find a cool bar or trendy restaurant every couple of steps and with one turn you'll find yourself on a stone pedestrian path lined with people, food, and drinks...or an indoor food stand bar. 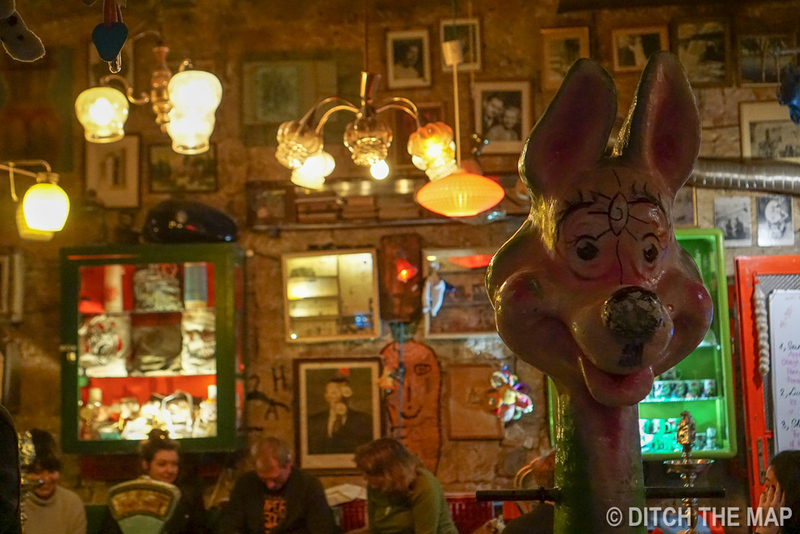 Budapest is full of exciting surprises with every turn especially after dark. We were surprised by the amount of english and American tourists. Although we have encountered a few American tourists during our travels, there was a heavier concentration here in Budapest. We found the ruinbar, Szimpla and ventured inside. The space was expansive. It had a large warehouse feel with a large open central hall and old stone walls. To our right and left were separate bars extending the length of the building and out back was a courtyard with even more bars. Definitely no shortage of places to grab a beer or hookah. 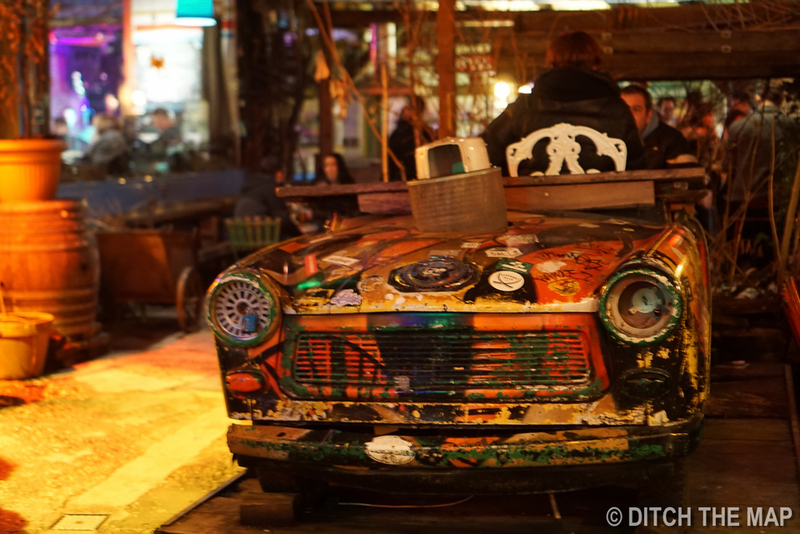 The entire place was decorated eclectically, filled with quirky objects that looked to have been collected from flea markets. There was an overall "Grungy-cool" to the bar. 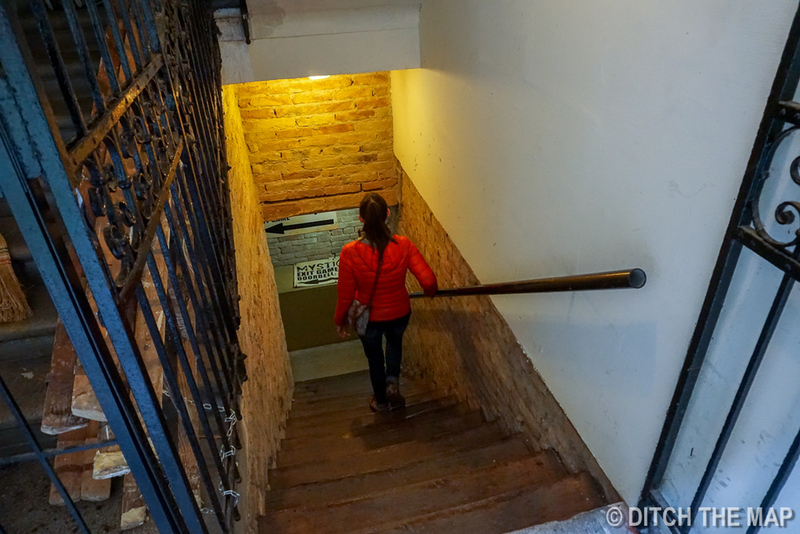 We explored the entire bar, upstairs and down stairs and all the hidden alcoves. What a cool and interesting place. We sat down to people watch with a beer (sold at tourist prices). We observed many tourists, a lot of english, and a big hipster population at the bar. We ended the night with subpar goulash at a restaurant near by. 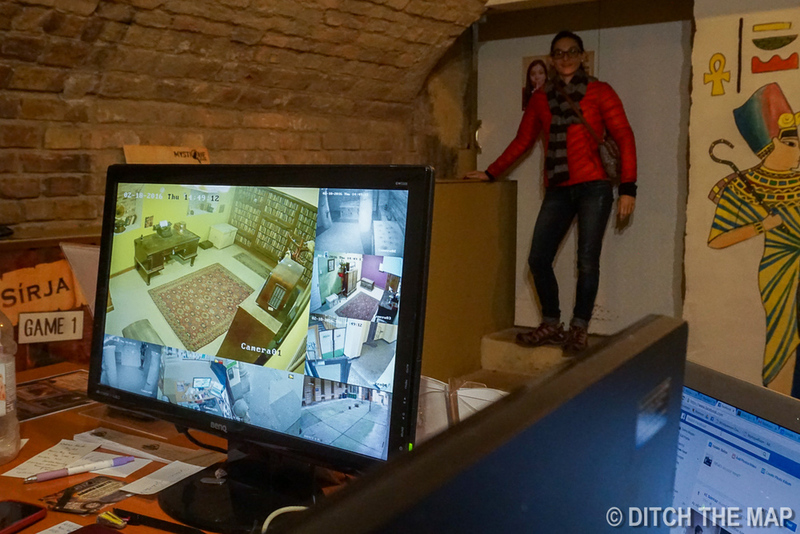 Eastern Europe is becoming known for the new trend, escape rooms. With cheaper prices in Hungary we thought it would be a good places to try one (~$36 for the two of us). We found an Egyptian tomb theme escape room online and made a reservation for that same afternoon. At the escape room we were debriefed and locked in the room where "a professor had been researching Egypt when he abruptly died leaving secrets of the tomb undiscovered." It was our job to find the treasures in his office and escape in less than an hour. We worked together to follow and unlock the clues. We lost some time stumped on one clue because as there was a contradiction with some numbers, a translating error we think. Back on track we actually uncovered a room attached the initial room- the Egyptian tomb. We escaped the room with only 26 seconds to spare! We enjoyed the game but found that the escape route was linear. One clue lead to the next there wasn't much thought required about each clue. We are still searching for the perfect escape room that really challenges our brains. We left the escape room feeling proud of our win and walked around a different part of the city. We stumbled upon a stone monument dedicated to the Hungarian victims of the holocaust. In front of the monument was a short barbed wire fence with old black and white photos and letters. Initially we thought that this memorabilia was in honor of the victims but after reading through some of the letters were leaned that many Hungarians, especially historians were so outraged by the monument that they wanted it torn down. They felt that the message of the monument was dishonest and historically inaccurate. The statue depicts a figure holding an object while a German bird swoops down threateningly from above. The statue suggests that the innocent Hungarian Jews were taken by the Germans, displacing the responsibility of the Hungarian governments actions at the time. Historians feel that the government needs to share the reality that they in fact offered up their Jews willing to the Germans- that the Hungarian government had enthusiastically hopped onto the nazi bandwagon. The historians interpret the statue as the stone figure holding the object up as an offering- giving the Germans their Jews. It was very interesting to see this demand for honesty and accuracy from the Hungarian people. They do not want their past to be misrepresented but instead want to take ownership and deliver a message of truth.